What Day Of The Week Was March 13? 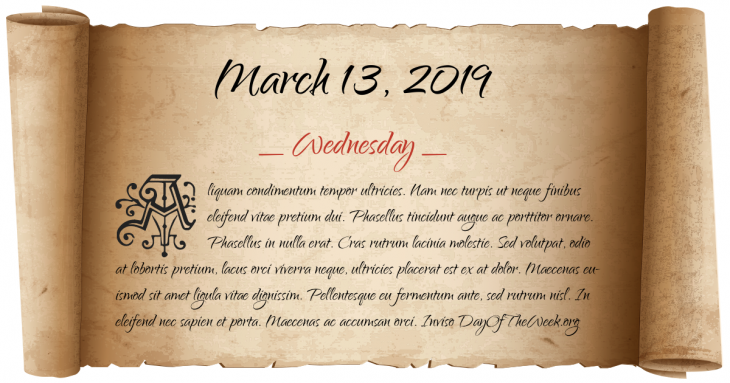 March 13, 2019 was the 72nd day of the year 2019 in the Gregorian calendar. There were 293 days remaining until the end of the year. The day of the week was Wednesday. Harvard College is named for clergyman John Harvard. Anschluss of Austria to the Third Reich. World News Roundup is broadcast for the first time on CBS Radio in the United States. World War II: In Bougainville, Japanese troops end their assault on American forces at Hill 700. Battle of Điện Biên Phủ: Viet Minh forces attack the French. An earthquake registering 6.8 on the Richter scale kills over 500 in Erzincan, eastern Turkey. Dunblane massacre: in Dunblane, Scotland, 16 Primary School children and 1 teacher are shot dead by a spree killer, Thomas Watt Hamilton who then committed suicide. Human evolution: The journal Nature reports that 350,000-year-old footprints of an upright-walking human have been found in Italy. Who were born on March 13?